GloFish are a type of zebrafish that have a brilliant, fluorescent glow, and are a great addition to aquariums in homes, offices and classrooms. They were originally bred by scientists to help detect polluted water. The goal was for the GloFish to flash fluorescent colors when in contaminated waterways, and display no fluorescent colors when in clean water. Although scientists have not yet been successful in achieving this, the results are brightly-colored fluorescent fish that are entertaining to watch. When observed under black lights in a darkened room, the colors are particularly brilliant and appear to glow. Install the filter and heating element in the tank and fill with fresh tap water. Zebrafish are not saltwater fish. Energize the filtration pump and check for proper circulation and filtration of the water. Check for any leaks in the lines and around the filter and pump. Energize the heating element and monitor the temperature of the water until it reaches 82 to 84 degrees Fahrenheit. Check the temperature often, as less expensive heating elements tend to fluctuate. Check the pH of the water using a pH meter or paper pH strips. Strive to maintain a pH of 7.0 to 8.0. Tap water is normally about 7.5, but you may need to adjust it with the pH adjuster. Introduce GloFish to tank gently when the temperature and pH of the water have reached the desired levels. Place aquarium cover on the aquarium, as GloFish can jump out of water. Feed with GloFish zebrafish food either twice a day (once in the morning and again in the evening), or three times daily. Put enough food in the tank so all the fish get some, and all of the food is eaten within five to 10 minutes. Excessive feeding will cause the tank to become dirty more quickly. Turn on the hood light for approximately 12 to 14 hours each day, and leave it off the rest of the time. Remove the standard white light bulb from the housing and install a black light for maximum display of the GloFish's bright fluorescent colors. This works best in a dark room with all other lights turned off. 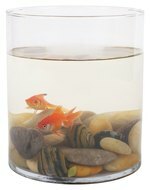 Clean the tank each week, or as conditions warrant, by removing a third to half of the water from the aquarium and replacing it with clean tap water. Adjust the water faucet until a temperature of 82 to 84 degrees Fahrenheit is reached prior to introducing it into the aquarium. 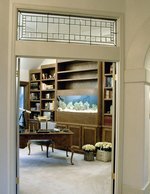 Refill the aquarium slowly to minimize the disturbance to the fish.